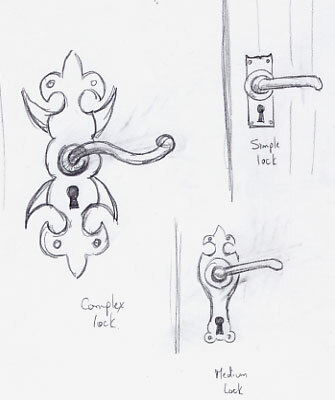 Here are some examples of door locks and handles. I know in the thief series the handles were always pointing down, but all the historical examples I could find had them sideways. Does that create undue stress on our modelers, or can they be easily mirrored? My idea was to have different shapes for different difficulty levels. A simple lock would be a basic square, and difficult locks would be fancier. There could be several different textures for each model as well to indicate even more difficulty levels. Ideally, I would like locks that look the same to have the same auditory 'pattern' so that players can learn to judge how difficult a lock is by sight. I would think perhaps four or five different model types, with 3 textures each, would give enough variety. BTW, in T1/2, the jiggling of the doorhandle told you how close you were to success. But how did chests work? I can't remember what visual indicator (if any) they used. I think that idea is also brilliant..Different locks different difficulty levels.. It s a very well thought concept..
Im on the locks. (hey im first here Atti..stay back )..Although i was making other (normal (?)) chairs but...I ll be uploading soon something over here..
Yeah, I think your funky style would suit these locks pretty well, TYROT. Feel free to go nuts on the more complicated ones. Remember that the handle will need to move. Chests had a lock with a little bar sticking out which acted in the same way as the door handle...a little unrealistic, and some other cases had no visual signal at all (but you can always hear the same noises).